E Shop Hosts have just launched the ideal novice or student hosting plan which is also perfect for start up ecommerce beginners. The Novice web hosting plan is perfect for beginners looking to set up their first online web shop as well as those already familar to hosting. This hosting account can be used for any number of reasons, eg student projects, hosting images for eBay listings, mini site or small eshop hosting or for some one new to hosting that just want an enexpensive hosting plan to learn the ropes. The list of possible uses is endless. So if you just want to host one small website our Novice Package is perfect and it benefits from all of the usual eShop Hosts hosting plans features such as the easy to use cPanel that has Softaculous one click software installer, PHP/MySQL 5 as well as easy to configure email accounts and databases and so on. Get a Discounted Domain registration with this plan, for an optional extra £5 you can add a .com, .co.uk, .net, .eu domain registration to use with this account. You will benefit from our experienced UK support team to help you with anything that you are unsure of and with a hosting account on our top-quality and superfast servers with the easy to use and industry leader cPanel control panel you can now get an excellent hosting account at a bargain price of only £19.99 per year! Our Novice hosting package is perfect if you just have a single website to host, need to host images, host a school or college project or want to run a blog. cPanel allows you to setup e-mail accounts, access webmail, create databases, install software in a few clicks, monitor visitors with Awstats and much more! It couldn't be easier to upgrade (or downgrade) at any time. You can do this automatically and instantly through our client area, My.Vidahost - we only charge you the pro rata difference in price. Every order is screened automatically during checkout to ensure that we protect our servers from fraudulant or risky orders, when you order our Novice Hosting plan it is setup immediately in a secure environment. All of our new Hosting Plans come with the popular and easy to use cPanel Control Panel with 50+ scripts and applicatioins available for ‘one click’ installation which is ideal for quick set up of your blogs, e-shops and minisites etc. With cPanel you can easily configure and manage all aspects of your hosting, email accounts DNS and databases etc as well as spam and virus protection and 24/7 Visitor Monitoring. As with all E Shop Hosts web hosting packages, the Novice Hosting Plan benefits from our highly commended ‘hand holding’ support service which means that we will help install the shopping cart software of your choice and any modules that you may require and give you step-by-step advice for any question or problem that you have so don’t worry if you’re new to hosting, E Shop Hosts are always at hand to help. With all of our Hosting Plans you can easily create and manage your Email Accounts for your hosted domains that is Blackberry/iPhone/Mobile compatible with easy to configure Webmail/SMTP/POP3/IMAP configuration as well as our Advanced Spam/Virus Protection. All email configuration is available within your E Shop Hosts client area or hosting the hosting cPanel area. 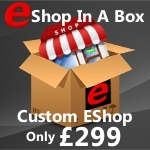 All E Shop Hosts hosting plans are flexible and are as easy to use as possible, and if your hosting requirements fluctuate then our Hosting Plans are easily scalable to either the a larger or smaller plan at any time on a pro rata cost basis. Is your eCommerce Ready for the EU Cookie Directive?